Pedro Almodóvar crafts films of wonder, displaying a mad world containing magnified emotions, dark playfulness and sensual visuals; in light of this, the BFI welcomes a celebration of his work, which includes his latest film, Julieta. The representation of an amplified daily life illustrates the skill of fusing melodrama, screwball comedy and noir, as to make sense of the folly which circulates the mind. By transporting us to the extremes of identity, we are given stories to make sense of our lives. The magical imagination of Almodóvar offers a look within the absurd and the grotesque, which is often concealed with a thick veneer. Censorship plagued the creative minds of Spain under the stringent leadership of General Franco; however, after his death in 1975, there was a rebirth of expression embodied within the subversive Movida Madrileña. This countercultural movement primarily took place in Madrid during the Spanish transitional period after Franco’s dictatorship; it gave impetus to the transgression of cultural taboos which were buried underneath the weight of rigid social structures. Morphing from a static scene, Madrid’s panorama transformed into a colourful chaos, hosting a hedonistic cultural movement. polBy doing away with the reactionary preservation of arbitrary ideals, this gave Almodóvar the chance to explore the tumultuous identity politics of the time. The new wave of culture embraced a DIY approach to art, which left the means of artistic communication in the hands of the youth. The open challenge to the sacred institutions of religion and family gave birth to Almodóvar’s first film, Pepi,Luci,Bom (1980). The perverse tale delves into the underworld of female friendship, which entwines a masochistic housewife, a teenage punk and a neighbour seeking vendetta. The brash and sordid tones which characterised his hyperactive early films, reflected the messy anarchy of the period; by exposing the complications of following institutional ideals, Almodóvar creates films that exist outside of morality. A sense of comradery pervades within Almodóvar films, particularly within the dynamics of female friendships; he seeks to represent “autonomous women, owners of their bodies and minds, who do without men, who make use of them.’’ In taking this approach, he opens up narratives of domestic dysfunction which display the fortitude of women, when experiencing moments of anguish, abandonment and betrayal. In light of this, the focus on female dynamics displays the growth process within emotionally destabilising situations. This notion is greatly explored in Women on the Verge of a Nervous Breakdown (1988), wherein the loss of love takes Pepa Marcos on a journey across the landscape of grief. In his celebration of the female identity, Almodóvar displays with ease the range and fluidity of emotions; in Volver (2006), there is an expansion on the idea of female power, as Penélope Cruz takes centre stage as the matriarch of a dysfunctional family filled with secrets. By roving across the unmapped female territory, we become more aware that the sheltered spaces of domesticity are not natural; instead, they are the product of patriarchal confinement which women have adapted to their own advantage. Amongst the wild upheaval of his characters, Almodóvar accentuates the flux of emotions with a vibrant palette of colours, which lends a pop art aesthetic to his creations. The glitzy images sometimes result in the generalisation of his work as zany—however, in identifying with women’s concerns, Almodóvar has a heightened sense of identity formation within a patriarchal environment. The exaggerated storylines, as seen in Kika (1993), a satire of television’s excesses. It showcases a vision of saturation, in which intense colours and costumes clash spectacularly; Jean Paul Gaultier’s brash designs accentuate the artificial setting, which provides an alienating but fascinating image. The contrast between dark subject matter and vibrant colours provides an unsettling panorama which pervades throughout Almodóvar’s filmography. The lively engagement with gender identity provides the ideal environment to foster change and alternate social bonds. To roam freely within the madness of a director’s vision, is to find freedom within the confines of society’s conventions. 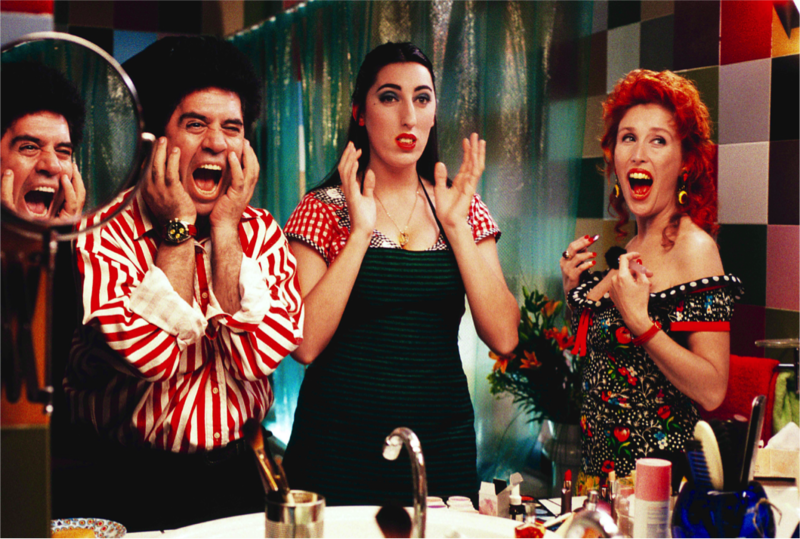 The artful blend of folly and everyday life is a reflection of Almodóvar’s creativity and artistic process. His exploration of identity has paved the way towards understanding the range of psychological reactions, which generates a great sense of pathos towards his troubled and complex characters. Enticingly, the parade of beautiful but grotesque personas enclose around us, as we become part of the flamboyant circus of Almodóvar’s making.